Choosing the right safe is an important decision that shouldn’t be taken lightly, and with so many variations in locking mechanisms, sizes, and steel gauge options, it’s tough to know what to look for in a safe. It comes down to the types of guns you have in your home and what kind of accessibility you want as an owner. Already know what kind of safe you’re looking for? Skip down to see our top three recommendations in each category. Sometimes called long rifle safes, stack-on safes, or gun vaults, long gun safes are meant to safeguard all of your guns in one secure location. And they are heavy, generally 750 pounds or more. Any long gun safe worth its salt is made from heavy steel and difficult to move. If you own more than a few handguns, we strongly recommend keeping your main home-defense weapon in a quick-access safe and storing the rest of your firearms in a long gun safe. Though these bigger safes are more expensive, we recommend that anyone with one or more long guns (rifles, shotguns, etc.) invest in a full-size gun safe. Size: Buy a bigger safe than you think you need. The last thing you want to do is invest in something as large and expensive as a safe, only to run out of space. Keep in mind that a good safe is more than a gun locker. You are also storing your family’s valuables in there, and you’ll find that you quickly fill up the space. Fire-resistance: Check the fire-resistance rating of the safe. No safe is fireproof, but some safes last longer and can take more heat than others. Buy a bigger safe than you think you need. The last thing you want to do is invest in something as large and expensive as a safe, only to run out of space. Placement: Just like with quick-access gun safes, you’ll want to pick a spot before you shop for your safe. Know the dimensions of your space and whether or not a giant steel box will fit through the door and in the location you want. Construction: Check the steel gauge. A heavier gauge steel is much more difficult to drill through than less-resistant light gauge steel. Anti-tampering measures: Does your safe have extra armor or devices to counteract drilling? Most low-grade safes can be opened with battery-powered tools in just a few minutes. 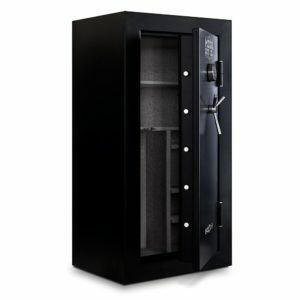 A good safe will have relockers that trigger when the safe is under attack. These relockers can only be retracted after hours of drilling. Look for a safe that has two or more relockers. 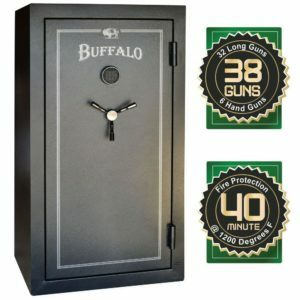 Buffalo’s 38-gun safe strikes a happy balance between its quality build and a reasonable price. The spacious interior is protected by 14-gauge steel and a pry-resistant recessed door, which would cause a real headache for someone trying to break in. We like the inside of the safe, too. Fifteen cubic feet gives you room for up to 38 guns, and adjustable shelves give you the versatility to organize your valuables inside. Mesa spared no expense when designing its 22-gun safe. While it doesn’t offer the same storage capacity as the Buffalo safe above, it takes its protective features to the next level. Any tampering with the safe’s drill-resistant lock will activate a relocking system, making it far more difficult to break into the safe. If you’re looking for a lot of interior space, it doesn’t get much roomier than the SentrySafe 51-gun safe. This behemoth comes with a convertible interior so you can organize your guns, ammo, and valuables appropriately. You’ll also get a power outlet and a built-in LED light. We also like the all-steel construction with 14 large, three-way locking bolts. A quick-access gun safe is a smaller safe meant to store your primary home-defense weapon and allow you fast access to your firearm in an emergency, all while keeping your gun safely out of unwanted hands. It’s generally located in a bedroom, office, or other area of your home where you spend a great deal of time. Quick-access gun safes are usually small enough to be carried easily and should be mounted to a larger structure (like a nightstand, bed, or desk) to prevent burglars from simply carrying the safe, and its contents, off with them. Don’t keep jewels, cash, or any other valuables in a quick-access safe. These items should be kept in a larger, more permanent safe where they won’t get in the way of you getting to your gun when you need it. Location: Where do you want to keep your safe? Have a spot picked out before you shop so you can find a safe with the right dimensions. You don't want a safe that is difficult for you to open. We recommend a pattern combination lock. Lock: What kind of lock is on the safe? How many locking bolts are there? We recommend finding a safe with a minimum of four locking bolts to ensure the door cannot be easily pried open. Ease of entry: Preventing children and intruders from accessing your guns is paramount, but you don’t want a safe that is difficult for you to open. We recommend a pattern combination lock. Warranty: If the safe is truly a good product, the company won’t be afraid to back it up with a good warranty. Read the fine print, because many warranties cover only a small portion of the safe’s value. Protection: What good is a safe that can’t protect what’s inside it? Look for a safe that has fire protection and thick steel lining. Not only does this safe implement a pattern combination lock, it also has a mechanical locking mechanism, which means you don’t have to worry about battery or power failure. Fort Knox receives consistently high user reviews on Amazon and takes the top spot for quick-access safes. With its diminutive size, this safe can be mounted almost anywhere. The point of a quick-access gun safe is to have easy accessibility combined with security, and the GunVault SV500 exemplifies both. We like the GV1000S for a couple of reasons: it’s small enough to mount almost anywhere you’d like without being in the way, but it can hold more than usual. You can store two guns if you’d like, or one gun with extra magazines for reloading. This safe is quick, it’s secure, and it’s affordable. Admittedly, we’re skeptical on biometric safes. However, after visiting ISC West and getting hands-on demonstrations of biometric safes, we’re warming up to biometrics and RFID. We still recommend pattern locks for quick-access safes but if you’re looking for a biometric gun safe, here’s our list of picks. This Vaultek safe might be the most sophisticated handgun safe on the market. You can access the safe with a key, electronic button, your fingerprint, or the phone app. That’s right, the safe comes with an app that helps you track usage, monitor for tampering, and adjust some of the safe’s features like its interior LED light. The PV500 has 10-gauge steel and 2½-inch solid bolts. It supports both biometric and pattern combination access. This is the biometric version of our second-place quick-access recommendation. Its small size and weight allow for it to be mounted just about anywhere. If you’re into biometric locks, this is great for desks or nightstands. No matter how heavy-duty a safe’s steel is, the door will still swing open if the locking mechanism doesn’t do its job. You want to avoid any lock that can be easily compromised, but keep in mind that an overly complicated lock can create its own problems of accessibility. Your fingerprints might be the one truly unique thing about you. Biometric gun safes try to capitalize on this by using fingerprint recognition technology to allow you quick and easy access to your firearm. With biometric locks, you don’t need to remember a combination or fumble with keys, so you get the quickest access to your firearm in an emergency situation. At least in theory. It sounds awesome on the surface, but digging a little deeper into biometrics raises a few red flags. The whole point of biometrics is to allow quick access to your gun, but what a lot of people forget to consider is that in emergency situations, your blood starts pumping, adrenaline takes over, and your hands get sweaty. We ran a simulated test with a GunVault Speedvault Biometric Pistol Safe SVB500 where we worked up a sweat and tried to open the safe using its biometric lock, and it took several tries to register sweaty fingerprints. Manual locks and electronic keypad safes are not as quickly accessible as a biometric safe, but they are more popular because they tend to be less expensive, and, in our opinion, more secure. There are three main types of safe locks: pattern combinations, number combinations, and manual locks. Our number-one quick-access lock choice is the pattern keypad combination. Pattern combinations are similar to numeric keypads in that they are designed with digital buttons that let you unlock your safe by pressing the buttons sequentially in a pattern of your choosing. Combinations can include pushing individual buttons or pressing multiple buttons simultaneously. We prefer a pattern combination lock over a numeric combination because there’s no need to fumble with keys, try to remember a complicated set of numbers, or worry that sweaty fingers will inhibit you from getting your gun. By practicing the pattern often enough, you can commit it to muscle memory, which reduces the chance of forgetting the combination during an emergency. Most of us are familiar with a numeric keypad safe. The safe is unlocked by entering a numeric code into the digital keypad. Though this method is not as fast as biometric entry, it still gives you fast access to your firearm. Some safes have the ability to program up to 12 million user-selected codes, which makes them more difficult to crack. A numbered keypad combination is our second choice for quick-access safes, behind only the pattern keypad combination. Key locks. These are the most straightforward, old-school type of locks that use a key to open your safe. Fumbling with keys slows you down and isn’t a great option for quick-access safes, and there’s always the threat of losing your keys—or worse, someone who’s not supposed to have access finding them. Dial locks. Dial locks are a more traditional style of locking mechanism. They don’t provide quick access to your safe, but they’re secure and slow to open. Most long gun safes will have a dial lock on the door with a three- or five-digit combination. Just because your safe is big, heavy, and steel-plated doesn’t mean it’s a good safe. In fact, countless safes have light gauge steel and can be penetrated with a simple fire axe. The steel gauge rating feels a little backwards: the lower the steel gauge, the stronger the steel. The stronger the steel, the more expensive your safe will be. That’s why some of the bargain-priced safes out there, though they may seem like a great deal, are really not good options to protect your firearms. We recommend finding a safe with at least 10-gauge steel. We all want to protect our valuables, and protection means more than just keeping burglars out of our safe. Fire can be a real threat to sensitive documents, cash, and more. If disaster strikes and your house burns down, replacing these things can be difficult, if not impossible. Prevention is key. But you should know that any manufacturer who claims that their safe is fireproof is straight-up lying to you. There is no such thing as a fireproof safe. Although no safes are completely fireproof, several quality safes are fire-resistant. A fire-resistant safe can protect its contents for a certain amount of time, up to a certain degree. A fire burning longer or hotter than a safe’s specifications will penetrate the safe and burn whatever’s inside. Larger long gun safes tend to have higher fire-resistance ratings than smaller, quick-access safes. Although fire rating is important, we recommend focusing on steel gauge and locking mechanisms as your primary security priorities, finding options that meet those qualifications, and then looking at fire-resistance ratings within your potential options. No safe is completely impenetrable. Given enough time, every safe can be broken into. But a gun safe can help prevent in-home tragedies by keeping your guns out of unwanted hands. Although a gun safe is a bit of an investment, it’s money well spent when you consider it as an investment in your overall personal and home security. What types of gun safes do you use and how do you feel about the protection they provide you? Leave us your comments below. Hi Peter, thanks for reaching out to us. A great safe that we recommend is the Winchester Ranger Series. It looks like they’re sold out on Amazon, but they are definitely worth looking in to. You can find it here: https://amzn.to/2HfzJs0. 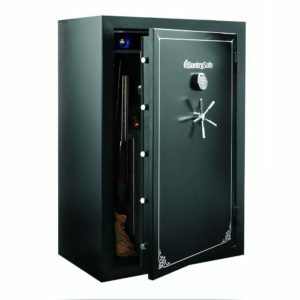 Another great safe is the Steelwater Heavy Duty 22 Long Gun complete with fire protection. It’s pricier, but definitely worth the investment with fire protection up to 1875 degrees, it’s drill resistant, and comes with pockets as well that could be helpful for storing your ammo. You can find it here: https://amzn.to/2qOvEEe. Lovely and detailed piece on gun safes. The quality of safe you are buying is very important..